Intertops Poker will dish out another $5000 in prize money from the $23,000 prize pool that the popular online poker site has put up for the second of three OFC Mega Money poker tournaments weekends coming up on November 13 and 14. There will be a $2000 Free Roll poker tournament on Saturday, November 13th, 2010 at 3:17pm EST. In addition to the $2000 prize pool provided by Intertops Poker, there’s another $500 in Forum prizes. Players must register by November 10th to compete. Then the next day for the “Everyone’s a Winner!” $3000 Added Buy-in Intertops will add $3000 to the player prize pool and there will be $1000 in Forum prizes. The tournament begins on Sunday, November 14th, 2010 at 3:17pm EST. ($5 + $0.50 Buy-in). "Our $5000 free roll in October was a fantastic kick-off for our OFC Series at Intertops," said Wolf Rosenberg of GGE which produces the Online Forum Challenge. "Our next buy-in tournament gives players the amazing opportunity to receive $10 simply for playing in a $5 tournament. You’re ahead before the first hand is dealt so you really can't lose, thanks to Intertops." 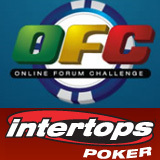 There will be another set of OFC Mega Money Tournaments at Intertops in December. Everyone that plays in two of the three Buy-in Events held this fall will be eligible to play in a $2000 Free roll to be held on January 15th, 2011.